Costanzo wearing his birthday suit! What a weekend! As I told you earlier last week, Costanzo celebrated a very special birthday last Thursday but since we were working we decided to have his party on Sunday and what a day we had! Just a small party with family and close friends and a great time was had by all. Unfortunately, the weather was not on our side for part of the day but thankfully we had the marquee set up to protect us from the elements. We managed to have a barbeque with Costanzo kindly being the chef as usual and he had the ingenious idea of making a makeshift tent to cover it from the rain, he’s not just a pretty face! 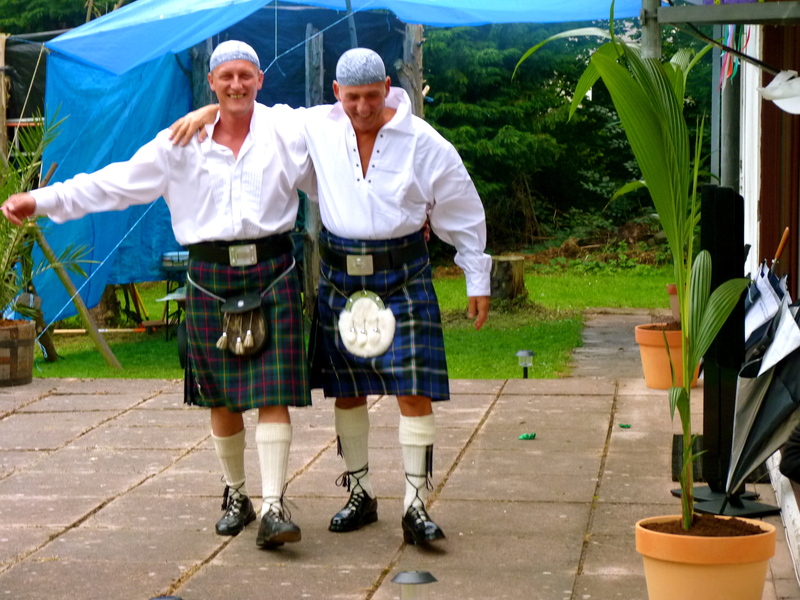 As you can see from the photo above, Costanzo is sporting his birthday present from us, a full kilt outfit! It took him completely by surprise as we had already given him our presents on his birthday. This is no ordinary tartan either, this is the very special Scots-Italian tartan which has been designed by Michael Lemetti of Clan Italia Ltd in Falkirk. Michael very kindly provided the entire outfit so we have to say a huge thank you to him for such a great job he has done. It made the day extra special and we really appreciate it. 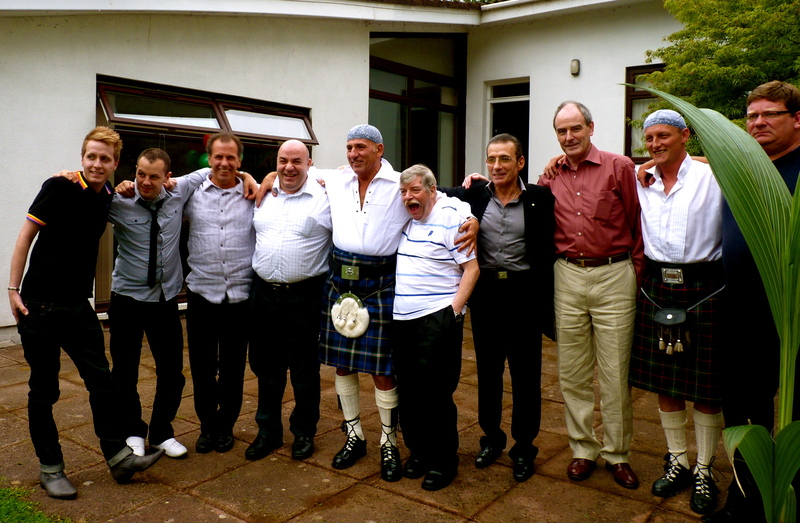 Michael has also had this kilt made up for Fabio Cannavaro, Reno Gattuso, Paolo Nutini and Silvio Berlusconi but I am sure that none of them are half as handsome in their outfits as Costanzo! If anyone wants to sport the same look as Costanzo, give Michael a call at Clan Italia and I am sure he will do a fantastic job for you as he has done for us. He can be contacted on 07903 – 133875 or have a look at their website http://www.clanitalia.com which shows the full range. Another big thank you from Costanzo to everyone who was kind enough to send cards and presents, he was deeply touched and really appreciates the thoughts from everyone. We really did have a fantastic day with great food, endless supplies of wine and wonderful company. Along with all the thanks, we also have to apologise to anyone in the vicinity of the party, which went on until almost 4am, for our noisy music, constant chattering and the accidental setting alight of a tree with our fireworks, we don’t do things by half! It was with great relief when we awoke the next day knowing that we didn’t have to open the restaurant, I’m not sure anyone of us would have made it in judging by the looks of us the following morning! We’re fresh (well almost) as daisies now though and open for business as usual today so hope to see some of you soon! 4 Responses to A Great Time Had By All! You aren’t just kidding about Costanzo being devilishly handsome in his new kilt! Bravo! Isn’t he just Judy! If anyone was born to wear a kilt it was him! I will pass on your lovely compliment to him and he can bask in the glory of his handsomeness!